Well, we had our first winter storm and Mother Nature was really cruel to us. She dumped 10.6 inches of snow Thursday into Friday. School got out early Thursday and was cancelled on Friday. It did warm up some on Friday afternoon and Saturday so some of the snow melted, but there is still a lot in the fields. The neighbor girls had a pretty fast sledding track on the hill and liked riding down. Haven’t seen the weather report for the week, but someone said cold, but dry. Hope so. Another report I heard is very cold winter with LOTS of snow. That can’t be right. St. Vladimir’s Church Ethnic Foods dinner will be on Sunday, the 25th, Noon to 5 p.m. at the Social Hall. Eat in or take out. Bob McGuire, Jr. and son, Tyler, Hunlock Creek, enjoyed visiting on Saturday with his parents, Bob and JoAnn McGuire. They brought lunch and we all had a good time. The last Civic meeting for the year was held on Tuesday. Will convene again in March. Membership dues are now due. See Heather McDonald to pay yours. New members welcome. On Saturday, November 10th, the Neufer family — 60 strong — gathered at St. Vladimir’s Hall to celebrate an Old Home Day Redo! A key member of the family, Barbara Harvey, wasn’t able to attend the traditional Old Home Day in August, so in honor of her birthday, we decided a redo was in order! From our traditional weenie roast and pinata to way more food then could ever be eaten, a great day was had by all. Family came from as far as Pittsburgh, just for the day! St. Vladimir’s Church has pierogies for sale. To order, call 570-1099. I guess deer season is coming up after Thanksgiving. Good luck hunters. Bear hunting is also in there somewhere so hope you bag the big one. Happy Birthday to Serenity Laird and Reese Baton, 23rd; Cassidy Brown, 30th. Have a good day. Hardly seems possible that the month is almost gone and we’ll be into December and Christmas. Seems like we just had Halloween. That’s it for this time. Enjoy your week. Hope you all have a wonderful Thanksgiving with family and friends. Give thanks to those who can’t be home because they are fighting to keep us free. 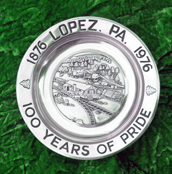 Have news call me at 570-928-9238; mail me; see me; or e-mail me at news@lopezpa.com. I’ll get it in for you. Thanks for reading and I’ll be here next time. Our new Main street bridge is done. Thank you bridge crew for a job well done.